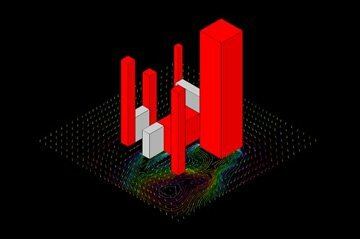 CFD may be used to evaluate air quality, contamination dispersion and wind forces in the petrochemical industry. Typical windwake analysis applied to a drilling platform. Velocity vectors are displayed in black close to the water while surface pressure contours are plotted on the structure itself. The information from this analysis allows engineers to assess the overall wind forces on the platform. 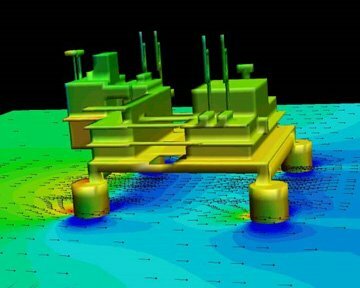 A windwake analysis showing a small chemical plant with leaking tracer gas. The wind in the wake of the building allows toxic gas to migrate to ground level where it is a hazard to people. Both concentration contours and velocity vectors are displayed.